I plod along after her into the darkness, filling the cup, finding the blanket, and tucking her back into bed. But last night she dashed across the house in the darkness and climbed right up into my arms. When I asked her what she needed, her eyes flickered open for the briefest moment. She whispered, “I need Mom” and then fell asleep. My little one needed me for me, not for what I could do or provide, find or fill, but for my presence and love and the safety of that relationship. It’s so hard to say when it’s easiest to start taking our relationship with Mighty God for granted. Perhaps it’s when times are hardest and our conversations with Him can become an endless litany of our need and pleas for His help and intervention. We too often want Him only for what He can do for us. We need that job, that financial deliverance, that health, that relationship, that restoration, that guidance, that intervention, that advocacy, that victory. Maybe we even search the Scriptures filtering out everything that doesn’t seem to fit or speak to our particular circumstance or situation. Yet, while God always invites us to bring our requests and needs to His feet, surely the desire of His God-heart isn’t that we only ever ask for the drink of water or the blanket in the middle of the night. 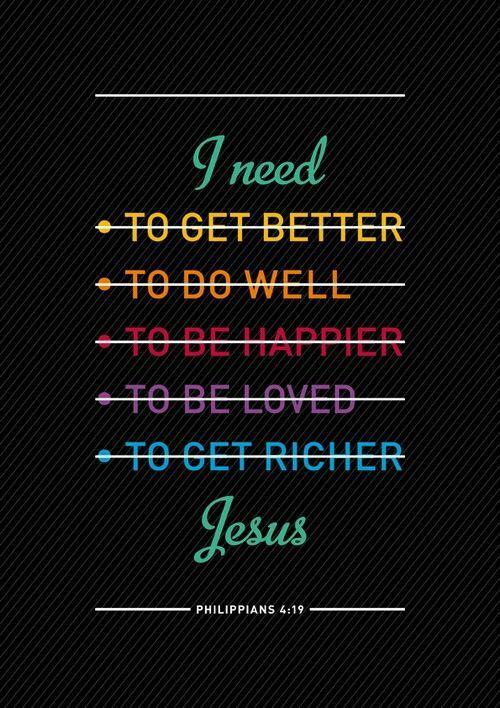 I need Your provision, yes. Your strength. Your help and wisdom. All those things. And this is the simple truth of this life: That we need Him like breath and food and water, the very life-sources of this physical body. Perhaps you forget this like I do at times: Taking Him for granted….forgetting my dependency and trying to act all foolishly independent. Like the Israelites in 1 Samuel 4, sometimes we treat God as little more than a good-luck charm that we slip out of our pocket on test days for a little extra help and good fortune. God had promised to be with His people, deliver them, protect them from their enemies, and provide them with abundant harvests and a life of plenty…IF they obeyed Him and stayed faithful to Him. They, of course, had wandered and strayed, disobeyed and worshiped other gods. Then they said, “Let’s bring the Ark of the Covenant of the Lord from Shiloh. If we carry it into battle with us, it will save us from our enemies.” (1 Samuel 4:3b NLT). They didn’t revere the Ark of the Covenant as the earthy dwelling place of God’s glory and they didn’t begin by repenting of all the sin that had driven them to this place of near-defeat. To them, it was a rabbit’s foot, a pair of lucky socks, a token or totem, no different than the idols of rocks and stone carried around by the enemy. So, they decided to drag the Ark out and carry it into battle, assuming that God would take it from there, carry the day, and fight on their behalf. Even the Philistines revered God more in that moment. They were terrified by news of the Ark’s arrival, knowing full well that if the One True God decided to fight that day, they had no chance of defeating the rag-tag Israelites. The enemy knew of this God by His reputation–the Deliverer from Egypt and the God of the Plagues. Yet, God, doesn’t allow Himself to be used and abused like that—not then, not now. The Israelites lost the battle and the Philistines carried off the Ark like a war-prize, not because God couldn’t defend His people. Because His people forgot that they needed Him, all the time, every day. Today we remember to pray: God, I need You and You alone, not for any thing, but for who You are. You are all I need. Reblogged this on Pastor Gary Nelson. The Bible is full of “ifs” we like to ignor.